RikTheMost - Airports, Denver and Fort Building... Oh My! Airports, Denver and Fort Building... Oh My! I've arrived in Denver!... Well, those of you that follow my social media (which, by the way, if you don't, you TOTALLY should!) and those of you that are my mum will know: I've actually been here for a few days already but I just haven't had time to blog it all out because there's been a whole lot happening! Some would say too much, but those people would also be the physical incarnation of my own anxiety and actually only exist inside my head for the purposes of self-sabotage, so they can, quite frankly, piss off because they would be wrong! It's been a whirlwind of awesome so far! I've already lost countless homes and livestock to this poetical storm of an adventure and still keep finding myself continually jumping back into the SUV of my mind and chasing the next hurricane that rears its beautiful head in my subconscious side mirrors. "Jesus, Rik - put the metaphor down a second! What have you actually done?" Anyway, so I've arrived in Denver! Gosh... ever feel like you've been on such a long journey and not actually gotten very far? "Is he referring to this blog post or American airport security again?" Hah! It's both! - I never leave metaphor!!! 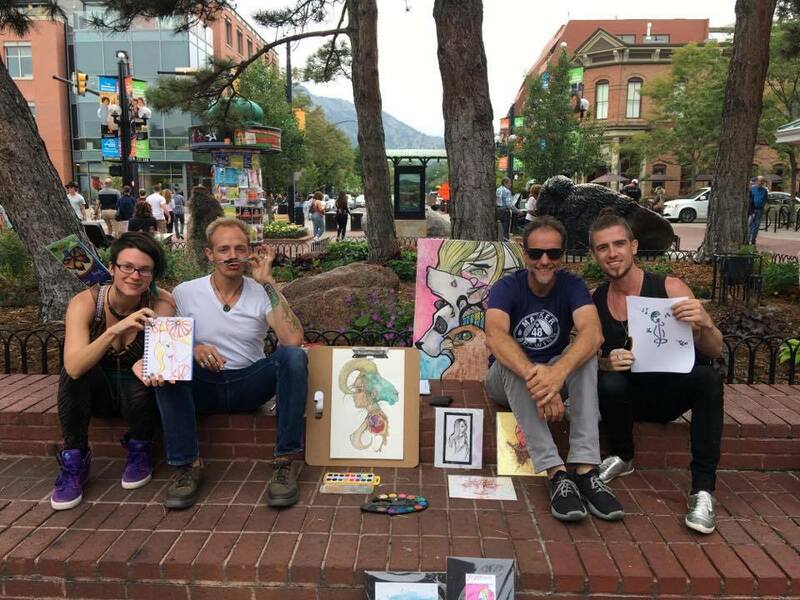 But look, this post wasn't meant to be about this - I wanted to tell you about visiting Red Rock Amphitheatre and doing some freestyle poetry jamming and creating doodles with these guys in the street in Boulder and eating the most amazing vegan ice cream and completing official registration for the slam and how nice it is that the teams out here are genuinely excited by our presence and the sheer electric storm energy of the poetry we've already seen and the bonding of our team through our rehearsals and the fried cauliflower burger I ate earlier and and and... there's JUST SO MUCH! But, it's really late now - rapidly approaching 4am... and I'm tired and I'm up early tomorrow and I've yet to even start building tonight's fort to sleep in (I know... I could just sleep on a sofa... but shut up - I don't question your life choices...) so I'm going to get some sleep! But here is a very important graphic regarding Team Slama's bouts, coming up! They're going to be live streamed on the Slamalamadingdong Facebook page so scribble on your calendars, set your alarms and brew up some coffee (especially my English fam! Time zones right?!) because it's gona be frickin awesome!